For our second recipe, we chose a simple tea that is delicious, healthy, and easy enough to make any time of day to refresh your practice. This classic infusion of ginger, lemon, and honey has been called a detox tea and a natural caffeine-free tonic for focus. This makes it a perfect choice for refreshing a quick practice break, or to warm your hands and clear your head before you begin. Taking a well-earned break, or having a pre-practice routine is a great way to keep your mind focused and clear. This tea is lovely before a cool spring morning practice, or strained into a thermos to sip on your way to the practice room. 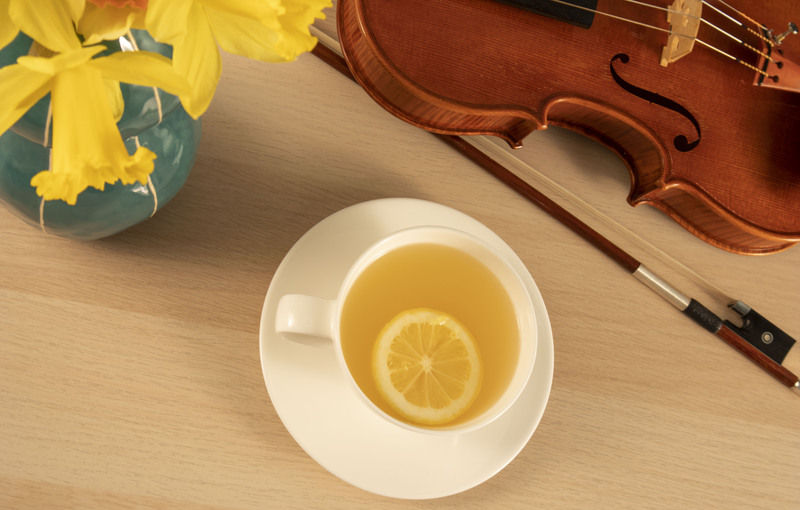 Take some time during a long afternoon of practice and enjoy this tea with a light snack. We prefer to use fresh grated ginger, sliced lemon, and raw honey, but you can always substitute a ginger tea bag, a dash of lemon juice, and a squirt of liquid honey. Use the following recipe to create the most robust and flavorful infusion imaginable! Add first three ingredients to a large cup or mug. Remove boiling water from heat and carefully pour over the ingredients in the cup. Stir gently and let steep for 5 minutes. Drink directly out of the cup, or strain into a thermos. Focus on your daily practice with a clear mind and renewed vigor.